Even if you've never changed the f-stop on your lens or through your camera, you've probably noticed this setting at some point. While its entirely possible to leave the camera to deal with this and never adjust it yourself, it's arguably the most important thing to learn if you really want to take charge of your photography. Otherwise known as aperture, the f-stop regulates the amount of light that can pass through a lens at a given shutter speed. Assuming nothing else changes, a small aperture will let in less light than a larger one, so it would take longer for the same quantity of light to pass through to the sensor. It works on the same principle as an hourglass, in that the size of the opening between the two chambers dictates how long a quantity of sand will pass from the top to the bottom. 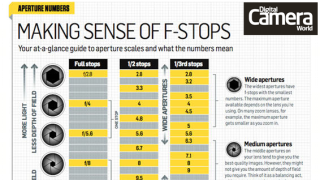 So, the smaller the aperture, the longer the shutter speed you'll need in a given scenario. You can see this for yourself by setting your camera to its Aperture priority mode and adjusting the aperture in either direction: the shutter speed should change with every click of the dial. Something that confuses a lot of novice photographers is that small physical apertures have high f-stop numbers such as f/16 and f/22, while large (or 'wide') apertures have low f-stop numbers such as f/1.4 and f/2. You can read why this is here. So, what kind of impact does the f-stop, or aperture, have on your image? First, it has the potential to affect exposure, although whether it does so depends on the exposure mode you use. If you use the Manual mode, for example, and just change the aperture without also changing the shutter speed, your image will become darker or lighter depending on which you adjust this. In the Aperture priority mode, however, your camera will automatically adjust the shutter speed as you do this to keep the same balanced exposure at all times. Ever hear these terms? Stopping down the lens or aperture simply means to make the aperture smaller, such as from f/8 to f/11. Opening up, meanwhile, means doing the opposite. Whichever mode you use, changing aperture has an effect on depth of field. Depth of field concerns the extent to which different areas in the scene are rendered in focus, and a photographer will typically use a medium or small aperture to achieve more definition throughout. Depth of field does, however, also depend on other factors, such as where you focus in the scene. There are issues with using both very small and very wide apertures, so you need to judge this from scene to scene to understand which setting is most appropriate. Wide apertures are great for isolating subjects from their backgrounds, but images can be softer at these settings due to an effect known as spherical aberration. Particularly wide apertures can also be tricky to use in bright conditions, as your camera may not be able to use a fast enough shutter speed to keep everything exposed correctly, which leads to overexposed images. Small apertures, meanwhile, can make an effect known as diffraction more prominent, which also has a softening effect on images. These apertures are also harder to use when hand-holding a camera, as the smaller the aperture the longer the shutter speed you need – and at some point you simply won't be able to hold it steady enough to produce a sharp image. Here, a tripod or an effective image stabilisation system can help.